My Journey to Fit: 2016 Nutrabolt 10K Race Recap! 2016 Nutrabolt 10K Race Recap! Super soft cotton race shirt, with Kyle Field pictured in the numbers. I didn't expect to be writing a race recap - I planned on spectating this race. But as it turned out, on Friday afternoon several bibs were offered up, for free, from some of our runner friends who'd signed up but ended up not being able to run the race. Since Jeff and I were going to run six miles anyway on Saturday, we decided to take the bibs and run the race on Sunday. I have to say that a lot of races don't allow bib transfers, and I don't know if this one did, but the bibs were already paid for and the race was sold out, so I didn't feel bad about using them. Besides, I liked being called Rachel for a day! After the race, a volunteer said "great job, Rachel" and I just said thank you, while Diane giggled. If you'll recall, this was the race that Jeff and I DNF'd last year - you can read about that saga here, which is why I wasn't that excited to sign up for it in the first place, although the route had been changed completely and this year, both distances would finish on Kyle Field, which is the famous football field at Texas A&M University. But I'm not an Aggie, and we were registering for other races, so we decided to sit this one out...well, until two days before the race. Anyway, bibs happened and the rest is history. Race day dawned early, even with the start (in front of Kyle Field) being only a few minutes' drive from our house. But the race began at 7:00 am - thankfully, because it was hot and humid - and we had to park and walk under a tunnel that would be closed off at 6:45 am because the race was going to go through it, so we got to the university right at 6:00 am and met up with our fellow renegades. There were 1,500 runners between the half marathon and the 10K, so it was a pretty lively crowd, and a much better experience than the year before, when the 10K started at a different location than the half, and a lot of runners didn't even show up because it was raining and windy. This felt like an event, and when they played the Aggie War Hymn (here's a video taken about six weeks ago at an Aggie home game - you can hear the War Hymn and see the area where the finish line for the race was), everyone was amped up and ready to run. We were amped, trust me. The race started and Diane and I set off, trying to not go out too fast in all of the excitement. We only ran a little bit before hitting a nice downhill where we ran through the tunnel. Of course, there was an uphill to get out of it, but still, you know how much I love my downhill running. We changed up our intervals for this race - instead of doing our usual 2:45, we switched to 3:1, with the reasoning that we run for an entire mile before taking a break on our weekly runs - surely we could handle running for three minutes at a time, right? We were doing really well, even with the heat...it was 72 degrees with 100% humidity when we started, so we tried to slow ourselves down and just treat this as a regular run. That worked for a while; mile one came up really quickly, and then just as quickly we were at Barbara Bush Drive, which is a winding incline that leads to the George Bush Presidential Library. We've run Barbara's road several times before in other races, and I don't understand why she had to make it so steep - didn't she realize runners would be tortured by it? Actually it didn't seem that bad this time, but I suspect that's because it came at mile 1.5 instead of mile 6, like in previous races. There were aid stations every 1.5 miles, with plenty of water and Gatorade. I started out with Tailwind in my water bottle but did take a cup of water at each stop, just because it was so darn hot. My fingers started swelling up and it was hard to bend them - I was sweating like a fiend and by the end of the race I could feel a layer of salt drying on my face. We hit mile two and I was doing OK, mentally, which for me was already a minor miracle. 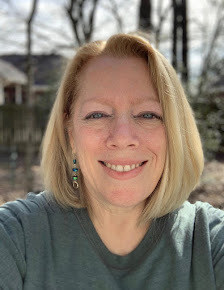 Mile three came and while I was telling myself "you regularly run three miles with Cary on Thursdays, you can do this," I started to feel like I was never going to get finished. By mile four, the wheels were starting to come off and I was taking extra walking breaks. When we hit another tunnel and had to go uphill, which was much steeper than the first one, I could barely walk it. Looking back, I think I just ran out of gas - the heat and humidity got to me, and while only using Tailwind worked the last time I ran a 10K, just two week prior, it was a lot cooler and I think I probably could have used some additional fuel. Not gonna lie, this was pretty cool! Here we are on the Jumbotron - it's hard to see, but if you click the picture you'll find us. His moment of glory...and now, his Facebook cover photo. There's such a height difference with us that Diane has to duck down when we take a selfie! End zone - right after this, we touched the goal post for good luck. We saw another runner put her medal on the football field and take a picture, so we did the same, just on the edge of the field. Snapped a couple of shots and got out of there fast, as A&M officials were approaching - they didn't want anyone on the field. What can I say, our Renegade-ness was showing. They had beer, but I don't drink and actually none of our group had any. I may end up planting succulents in this - it's a pretty blue color. Going along with the Oktoberfest theme, they had giant soft pretzels for the runners. Only problem was that they tasted awful - the texture was not like any soft pretzel I've ever had, and I tossed mine in the trash after one bite. It seems that most people felt the same way, which was disappointing - soft pretzels would have been wonderful after that race! They also had some sort of bratwurst hotdogs available, but we all held out for our regular breakfast at Blue Baker. The emergency call station is also good for propping up tired runners. And then Brian got his award - another hat! He has a new nickname: "Podium Brian"
I love how the ledge gave Karen, Julia, and I a chance at being the same height as Brian, Diane, and Jeff. I have to say, this race far exceeded my expectations, based on the previous year, and we will most likely register for it next year. 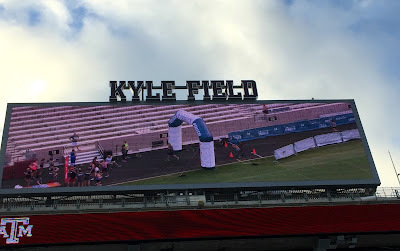 The race director, Dan (former co-owner of the running store) really did a great job with making this a unique experience - I didn't think getting to run on Kyle Field was all that big of a deal, but as it turns out, it was a very neat opportunity - and a rare one, at that! How cool that you got to race for free and having a jumbotron at a race is great perk! You might be right about the soft pretzels needing to be eaten right away. Dang it, now I want a GOOD soft pretzel! So, it sounds like this race is going to have "weather" no matter what - from pouring rain to 100% humidity. At least now you've done the 10K and know what you're in for. And it seems like you guys enjoyed and had fun which is all that really matters. I thought this was a last minute change of run plans! Yay for 10K. You know I love that so many of your races start early - I wish the ones around here did. I've been trying to decide if I was going to run a 5 mile race in a couple weeks and then found out it doesn't even start until 1:30. Um, no thanks. Starting at 1:30 pm??? Are they crazy?? Even if the weather is decent, who wants to start a race that late in the day? By then I'm ready for a nap and lunch! Lots of races start here at that time, one of the reasons I don't do it anymore. It costs the entire day that way. I would love it if they did races in the morning here but till now, no such luck. Amazing race, it's pics and posts like these, that make me want to keep pushing. Well thanks for saying that - makes me feel good, because I'm not a super runner or anything inspirational, just someone who gets out there and gives it a good try. That's great to run the race for free! I think that would be so amazing to finish on the field like that!! Way to go! Thanks - it was fun, and free made it even nicer! Well, good deal on an unexpected race. Except the 100% humidity. I can hardly imagine. But then I think real hard, and I DO remember it. Yuck. But super cool that you got to run on that big field!! Too bad the pretzels sucked cause that is an awesome idea! Ha, this is reminding me how I bought a soft pretzel in AK at a gas station and it was really $$ and I threw it out cause it was so stale. Sorry, totally unrelated. It's just sad to lose a soft pretzel. Too bad they don't allow bib transfer and you had to be Rachel! :( Have you ever done that before? LOL on hating to waste a good soft pretzel! I've never worn someone else's bib before, although I have run a race with someone who was doing that. That was a huge race and she got a lot of encouragement from spectators, all calling her by the name on her bib - made us laugh the entire race! When I did my Spartan race at Miller Stadium in Milwaukee, they actually had security guards everywhere on the infield so no one could even attempt to walk out on the field - lucky for you, that you got that chance! I am trying to figure out how they could have ruined a soft pretzel? Well done! And such a cool finishing place. If I ever do a half in my life, it will be Amsterdam because you start and finish in the Olympic stadium.